It was cold and windy as we checked to see that our P2V-3 was ready for a mission scheduled for 1800 hours. It was the day after Christmas, 1951 and VP-6 was deployed to NAS Atsugi, Japan. Our crew was to patrol the East Coast of Korea. The Navy had a task force operating off Wonsan, and we were to be their anti-submarine patrol. Around midnight, we were to be relieved on station by another P2V, fly north to the Korean border, and then turn and fly along the East Coast and report weather conditions to the fleet. It was to be a twelve to fourteen-hour flight which was pretty much routine at the time. This was the second tour for VP-6 in Japan during the Korean police action. Our crew had trained together at NAS Barbers Point and flown several hundred hours during this deployment. We worked very well together. Our crew consisted of: Cdr. 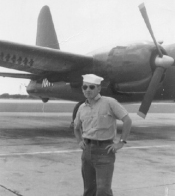 R.J. Perkinson, Patrol Plane Commander and Executive Officer of VP-6; Lt.Cdr. L. A. Garland , Co-pilot and was to be the new Executive Officer of VP-6; Lt(jg) E. H. Hemmer Navigator; R.L. McKnight AD1 Plane Captain; K. K. Hathorn, ALC First Radioman; J.B. Manning AL3, Second Radioman; H.E. Bowlin AD 1, Second Mech; and R.J. Martin AO2 Ordnanceman. That afternoon, as soon as the aircraft became available, we assembled at the plane to complete our preflight checks. We verified the status of the fuel and oil load, ammo, depth charges, and everything we might need on the patrol. The aircraft had 2350 gallons of fuel across the wing. We also had two 250 gallon bomb bay fuel tanks (the 700 gallon inboard main tanks were used first so that the fuel could be transferred from these bomb bay tanks, to the main). When we were done with the preflight checks, we returned to the barracks for a nap. We were to reassemble at the aircraft two hours prior to our flight, at which time we would take care of last minute details such as food and conduct a final check of safety items. Thirty minutes prior to flight time, we turned the engines up. The mags, props, radio and radar gear, were all checked again to be certain that they would operate properly. The pilots showed up ten to fifteen minutes before flight time, and since all was well, they boarded, and we prepared to taxi. The aircraft checked out good so we taxied out, received our clearance and took off. En route to the task force we checked the wing and tail heat, the prop deicers, and the heat inside the aircraft. This flight started out about as routine as it could be. We had coffee and a bite to eat, and by about nine-thirty, I was able to transfer all the fuel from the bomb bay tanks to the inboard tanks. On station, we patrolled the task force area providing radar coverage and searched for submarines. Eventually, we started hitting snow and the PPC, Cdr. Perkinson, increased rpm to climb. I noticed the starboard prop was not increasing as was the port. The pilot attempted to control the engine and the light on the console came on indicating that the prop governor was all the way at high rpm. Just as this sunk in, the starboard engine wound up to about 3500 rpms. The pilot immediately retarded the throttle and regained control, but we started losing altitude. We radioed the task force, advised them of our problem, and took up a heading for Pusan. The crew started tossing out whatever we could to lighten the aircraft. I tried to get to the ammo in the six 20mm cannons in the bow, but failed, so I went to the tail guns hoping to fire those two 20mm cannons and get all the ammo out. Before I could fire the tail cannons, the PPC directed me to make my way forward to my ditching station. Despite our best efforts, the aircraft continued to lose altitude. The altitude loss was so serious that we realized that we would not make Pusan and the pilots decided to turn back toward the task force and ditch alongside one of the surface vessels. We requested that they illuminate so that we could more easily locate the ships and ditch the plane in the vicinity of one of the vessels, and they agreed to our request. The chief radioman, K.K. Hathorn, relieved J.B. Manning on the radio and told him to join the Ordnanceman and 2nd mech. at the aft ditching station, and Hathorn sent out an SOS. The Navigator stayed forward. When I finally made my way forward from the tail to my ditching station, I found that Hathorn had prepared me a fairly decent place to ditch by using the navigation bag and a parachute harness. I sat down, and remembering that my responsibility during a ditching was to take the first aid kit, I reached above where I was sitting and pulled it from its stowage location and put it under my leg and more or less sat on it (Unfortunately it washed away during the ditching). I was seated right over the access door to the cockpit with my back resting against some tubing and that tubing was the only support for my head. When we impacted the water, the tail hit first and I heard a terrible scream from the cockpit. There was a second impact and it felt as if we had gone deep in the water. The aircraft came to a complete stop. My head and back were hurting, but I was still alive. So I got up and started moving toward an exit. My first thought was that I was the only one who made it. I was supposed to exit the astro-hatch, so I started moving in that direction and realized that the Navigator was still sitting on the deck forward of the wing beam. He told me that his belt was so tight that he could not release it, so I said "use your knife and cut yourself free." I stuck my head up through the astro-hatch, reached for the MK-7 raft launch handle, and pulled. All I got was a lot of slack cable. The raft was gone. It had launched when the tail had separated from the rest of the aircraft. The wing beam ran through the cabin and it was behind this that three of the crew sat for ditching. Soon after I discovered that the MK-7 raft was unusable, they had opened the escape hatch on the port side and had the MK-4 raft on the wing and ready to inflate. I could feel the navigator moving behind me so I exited through the astro-hatch. I climbed out on to the port wing and we inflated the raft. By the time the Navigator exited the Astro Hatch, the aircraft had settled enough so that the sea was washing over the wing. Manning had already slipped and fallen a couple of times, so I instructed the rest of the crew to launch the raft. While we were launching the raft, we heard a moan come from the starboard side. I looked over and saw the white face of Lt. Cdr. Garland making his way over the fuselage from the starboard wing. His ashen face had frightened me for a moment. We helped him over the fuselage, to the port wing and into the raft. We had heard nothing from Cdr. Perkinson, or Hathorn and the aircraft was quickly settling, so we decided to abandon our position on the wing and move safely clear of the sinking plane. By this time things had settled down a bit so I took stock of our situation. I felt the most important concern was our distance from the task force. Manning said that from the last report he got from the fleet, we were 28 miles from them. Based upon this, I figured that in an hour we would be seeing lights. Despite doubts from the navigator, I assured the guys that the ships would find us. The rest of the crew was feeling very low and I felt it was part of my job to keep their spirits up. I kept paddling and scanning for lights, and finally I was rewarded with a glow on the horizon. I couldn't be absolutely sure that they were lights, but it did raise my hopes and I informed the rest of the crew. The Navigator had his doubts about what I was seeing, but after watching them for quite a while, I was positive that I was seeing lights. With that, Lt.Cdr. Garland spoke up and told us not to forget the emergency flares attached to our mae-west life jackets, which I had completely forgotten. I detached the flare from my mae-west to activate it, but my hands were so cold that I could not get it lit. Martin, offered to light it and he was successful in activating it. Shortly after Martin lit the flare, the light, which I assumed was a ship, made a course change and appeared to head directly for us. Needless to say we kept a flare burning until the lights became a US Navy destroyer, and was alongside us. We weren't out of trouble yet. There was still a major hurdle before us, and that was getting aboard the destroyer. The water was extremely rough. The waves were so large, that as the destroyer approached you could see a considerable portion of the keel as it plowed its way through each successive wave. Under these conditions, I was very concerned about how we were going to get Lt.Cdr. Garland on board, and I was doubly so when the ship advised us that they would bringing us aboard with a rope. They passed us a line to fasten the raft to, and another that we could tie around ourselves to be hoisted aboard. When the first rescue line was passed to us, the Navigator grabbed it, fastened it about himself and was hoisted aboard. I got Lt.Cdr. Garland off to one side so he wouldn't be distracted by anything and explained to him about the line and how it worked. I put it around his chest and under his arms, warned him not to let the line slip over his arms, and showed him how to clasp his hands so we wouldn't lose him. If we had lost him in that sea I don't believe that we would ever have found him again. Luckily, he was hoisted aboard without incident. I think the next to go aboard was Bowlin, and they pulled him in and the line got fouled somehow. They dunked him three or four times before they cleared the line and got him aboard. I believe the next was Manning, and he was pulled aboard without incident. By this time they had two lines working, so Martin and I departed the raft together and we got aboard without incident. When I planted my feet on the deck of the destroyer, it was with the full intention of walking wherever they were going to take us, but I found I could not take a step; it just seemed like everything was frozen. A big old Boatswains Mate picked me up like a baby and carried me down to a shower where they removed our clothes and ran cold water on us. They slowly increased the temperature of the water until our circulation was normal again and we were reasonably warm. Then they put us in long handles and wool socks, wrapped us in blankets, and put us to bed on cots. They did not have a doctor aboard, only a Chief Hospital Corpsman. Sometime during the night I had to get up to go to the bathroom and the Chief Corpsman was sitting up with Mr. Garland. When I inquired about Lt. Cdr. Garland, he just shook his head, and said he could do nothing. The next morning we were transferred to the carrier USS Valley Forge ("Happy Valley Forge") which was due to pull into Yokosuka, Japan. Doctors on the carrier performed exploratory surgery on Lt. Cdr. Garland and discovered that he had a ruptured intestine and they repaired it. He was later sent to Tripler Army Hospital on Oahu where he made a full recovery. After the Valley Forge pulled into port, VP-6 sent a truck to Yokosuka that took us back to the squadron at NAS Atsugi. My wife found out about the ditching by accident. A friend drove her to the communications station at NAS Barbers Point where they showed her the dispatch advising our recovery and they allowed her to send me a message which I received on the USS Valley Forge. After VP-6 returned to Barber's Point, Lt. Cdr. Garland visited me at the squadron hanger and we spent the day discussing what had happened. After talking over the incident and discussions with Lt. Cdr. Garland's doctors, we came to the conclusion that on first water impact, the control wheels moved violently aft, and struck both pilots (the control wheels being moved aft by the forceful upward movement of the elevators on the horizontal stabilizer). Since Perkinson was probably sitting closer to the control wheel than Garland, his spleen was ruptured. It was believed that the radio gear came out of its mountings and struck Hathorn. Lt.Cdr. Garland said that the thing that aroused him after the aircraft stopped, was Perkinson releasing his seatbelt and shoulder harness and standing up; he immediately fell back to his seat. Now alert, Garland said that he stood up and exited the escape hatch over his head. Once in the water he tried to climb on to the starboard wing but was unable. So he swam to the engine and found that the top cowling had been carried away. By using the framework on which the cowling was supported, he was able to climb up and over the engine and onto the wing. We did not have much time to get away from the aircraft, because the fuselage had separated into two parts at the wing's trailing edge. After the initial impact, we heard nothing from either Perkinson or Hathorn. NOTE: This is the story of the plane captain. Russell "Pete" Mcknight. I was in a P2V-3 with another crew in a different sector flying an anti-submarine mission and weather for the fleet, and heard the SOS that the radioman sent. I wrote part of the story a year or so ago as "The Runaway Prop." and asked someone to tell "the rest of the story." Pete has done that. I have known these two respected career airmen and fellow site members, radioman Joseph B. Manning and PC Pete Mcknight since 1948. 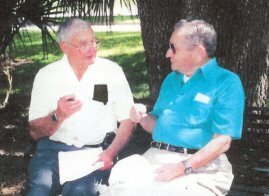 Manning was in PB4Y2's in 1948 when Pete and I were at the same base in PBM'S, sometimes flying in the same crew.